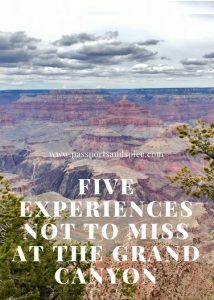 Five grand ways to experience the Grand Canyon. I dreamed about seeing the Grand Canyon in person since I was a little girl growing up in Slovenia. It was one of the big items on my bucket list. I did visit it soon after I moved to the U.S. 20+ years ago and it was even more impressive than any of the pictures I had seen at home. I was blown away. After hiking all the way to the river outlook plateau on the Bright Angel trail by accident during my first visit (long story), I could not wait to show it to my own kids someday. Finally, this past Spring break, that day arrived. 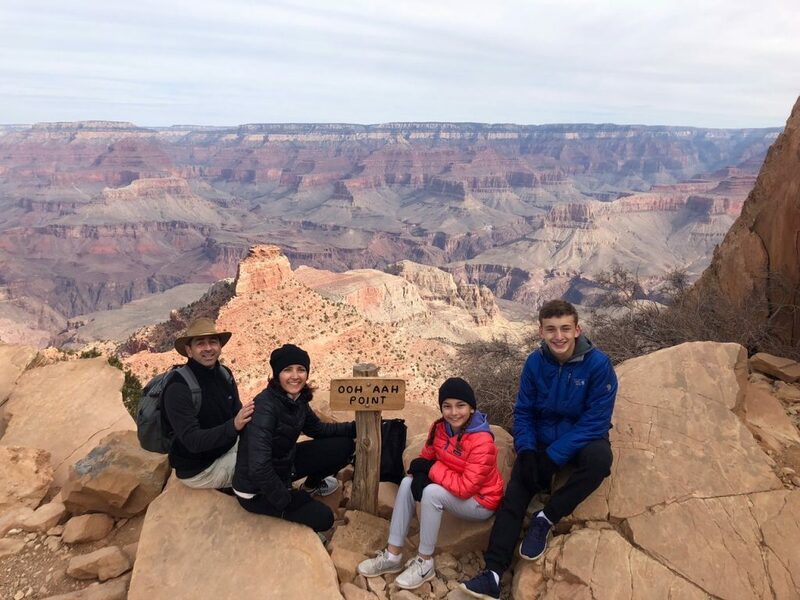 My kids, who are often getting too cool for school these days, were just as blown away as I was the first time I saw the Grand Canyon in “real life”. Seeing them go quiet, their faces in awe, just taking it all in, was as they say… priceless. No, I am not out of touch with most people’s reality, nor am I some luxury travel blogger who scored a free ride. This experience was expensive. For a family of four, quadruple expensive. Worth it? ABSOLUTELY! 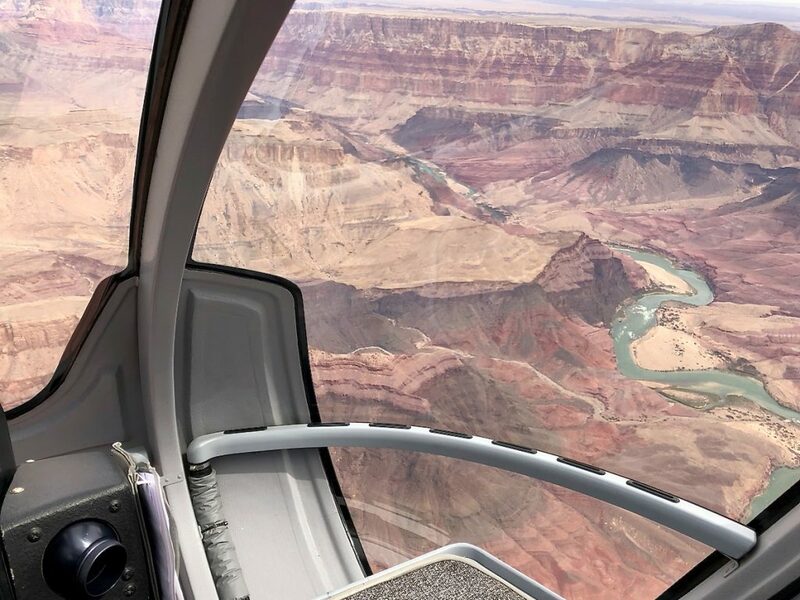 In my opinion, a helicopter ride is the most memorable way to see the Grand Canyon and begin to comprehend how vast, impressive and mind-blowing this creation of our planet it is. I would save up my money, be frugal with other things and do it again in a heartbeat. We chose Maverick Helicopters, partially because of their stellar safety record (there are a few nervous fliers in our family) and partially because of their Canyon Spirit route. The moment when the canyon came into our view shortly after our take off and after flying over the Kebab forest, felt like the best amusement park ride ever, only in real life. It was simply incredible and unforgettable. We landed exhilarated and speechless at the same time. Travel Pro Tip: If your kids are prone to motion sickness, you may want to consider a dose of Dramamine. Also, while the weather was chilly when we were visiting, it got fairly hot in the helicopter, particularly in the back seats. Being hot makes motion sickness worse and it is hard if not impossible to take of your coat while you are strapped into the seats. Err on the side of lighter clothing, I say. The views from inside the canyon during our helicopter tour with Maverick Helicopters were spectacular! 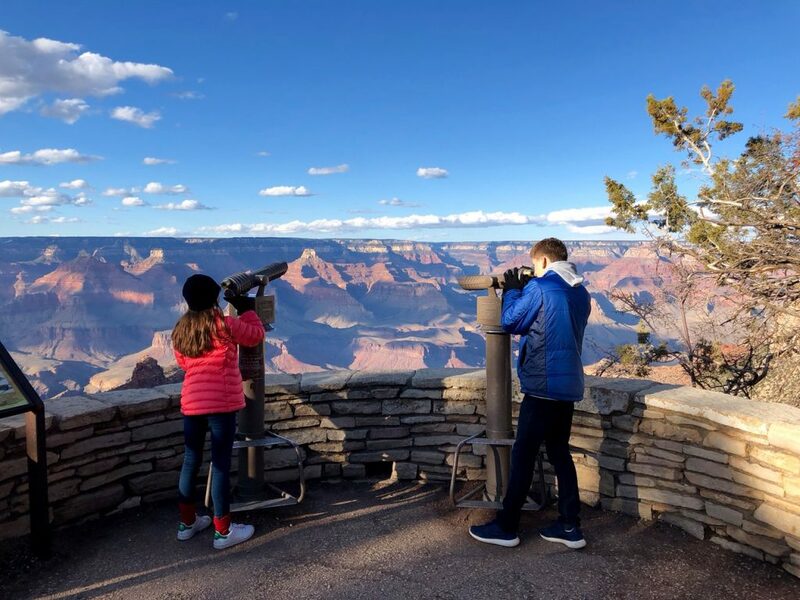 To help balance your vacation budget and… learn about the Grand Canyon, take advantage of excellent free guided park ranger programs. From talks and nature hikes to campfire programs and even star walks, they are offered every day at different locations in the park. Here is a list of all the programs or visit this page for an up to-date daily schedule (not all programs are offered year round). 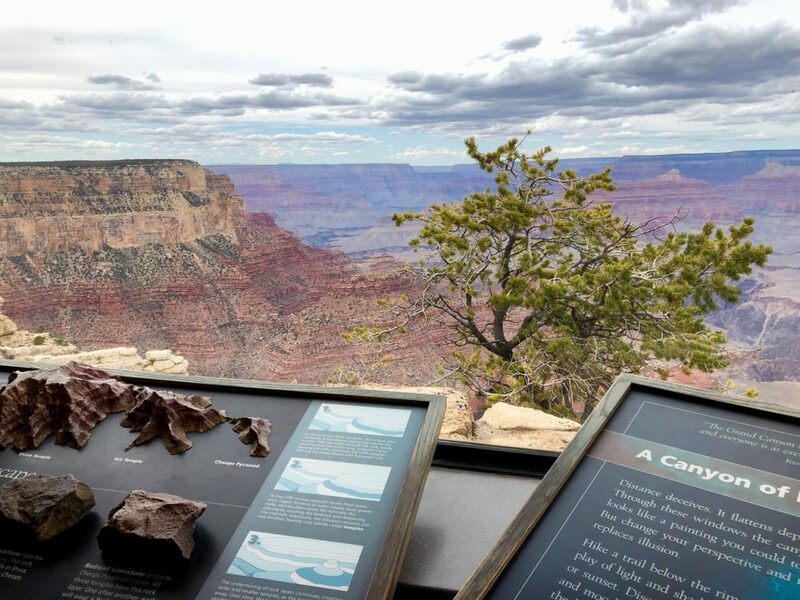 Learn how Grand Canyon was formed by exploring the Yavapai Geology Museum and attending a free ranger talk. 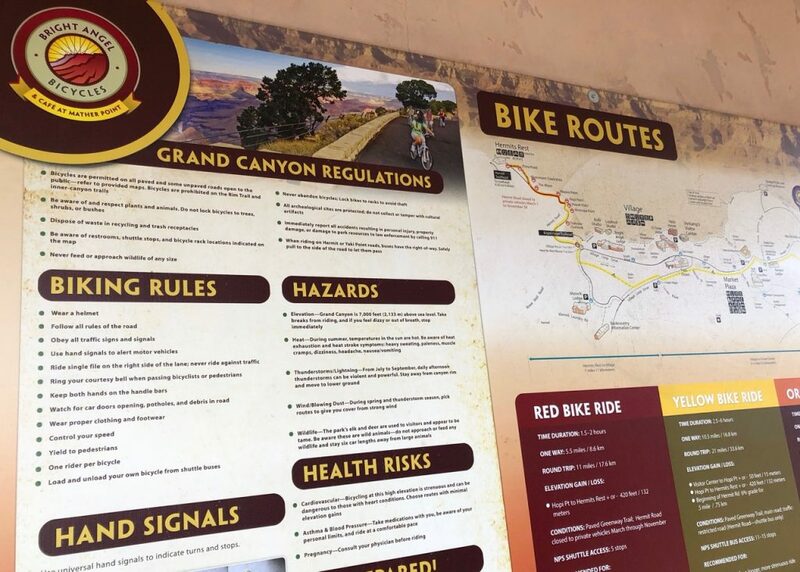 A great way to cover several locations along the South Rim and view the Canyon from several different points is to rent bikes at Bright Angel Bicycles. The shop is located close to the Visitor Center, where you can park and leave your car at the giant lot. They have a great range of bike sizes and also provide guided bicycle tours, which are very popular and often sell out during peak months, so make sure to reserve your spot(s) in advance. Travel Pro Tip: All the shuttle buses are equipped with bicycle racks on the front of each bus in case you want to ride bikes one way and take it easy on the way back. Just a thought. View various bike routes at the Grand Canyon South Rim and plan your own tour at the Bright Angel Bicycles shop. Don’t use “not being in shape” or “having small kids in tow” as an excuse to experience the Canyon only by looking at it from the rim. You made the effort to get all the way out here, so don’t stop at only scratching the surface (pun fully intended). You will get an entirely different perspective, not to mention the bragging rights, of course, by descending into the canyon. If you are visiting the South Rim, two of the most popular hiking trails are Bright Angel and Kaibab. They lead all the way to the bottom of the canyon, but you can stop and turn around at any point. 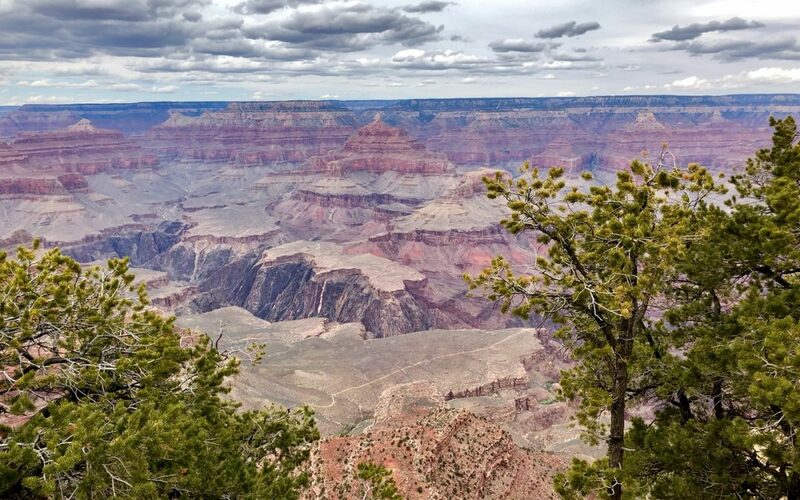 Travel Pro Tip: For a great, moderately long and challenging hike, take the Kaibab trail to either Ooh Aah Point or, if you have more juice, a bit further to Cedar Ridge. Once there, you can enjoy a picnic lunch, rest a little and take in the spectacular views, then head back to the top. The hike to Cedar Ridge took us about 3 hours round trip with moderate pace and lots of stopping along the way. Here we are, taking a short rest at Ooh Aah Point on the Kaibab Trail. The canyon is spectacular at any time of the day, but seeing it at sunrise or as the sun is setting is extra special. The colors are more vivid, making for even better photos, which won’t need any enhancements or filters. The canyon walls also somehow become softer as the colors take on different hues in the early or late sun. Three very popular sunset viewing points along the South Rim are Hopi Point, Mohave Point or Hermits Rest. Admiring the Grand Canyon shortly before sunset from the South Rim viewing platform in Grand Canyon Village. Travel Pro Tip: In order to get to all three spots mentioned above, you will need to take a shuttle bus. The road is closed to private vehicles. Hopi and Mohave are relatively close, but Hermits Rest Route takes about 75 minutes round trip. Check on the timing of the sunset at the Visitors Center or via an app and plan accordingly.